He wasn’t really lost. But I love a good challenge…and good surprises. Did you see the blog post last month about my difficult lesson? I had tunnel vision eight years ago and missed the opportunity to see (and photograph) a hero’s grave. Well, as I set out on a Virginia research/road trip after the ECW Symposium, I determined to re-discover some forgotten heroes long-lost in the archives and some historical markers. 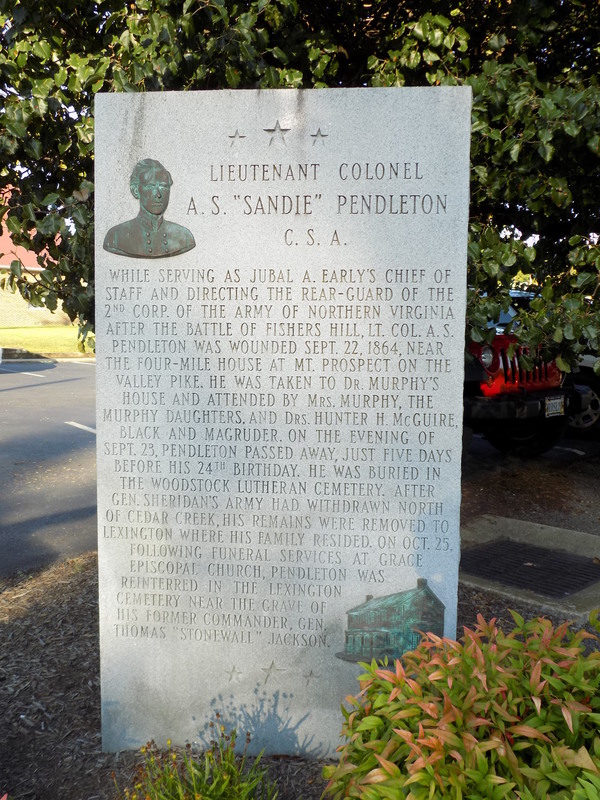 One of the guys on my research list is Alexander Swift Pendleton, better known as “Sandie” Pendleton. (I’ve written about him and his wife before.) 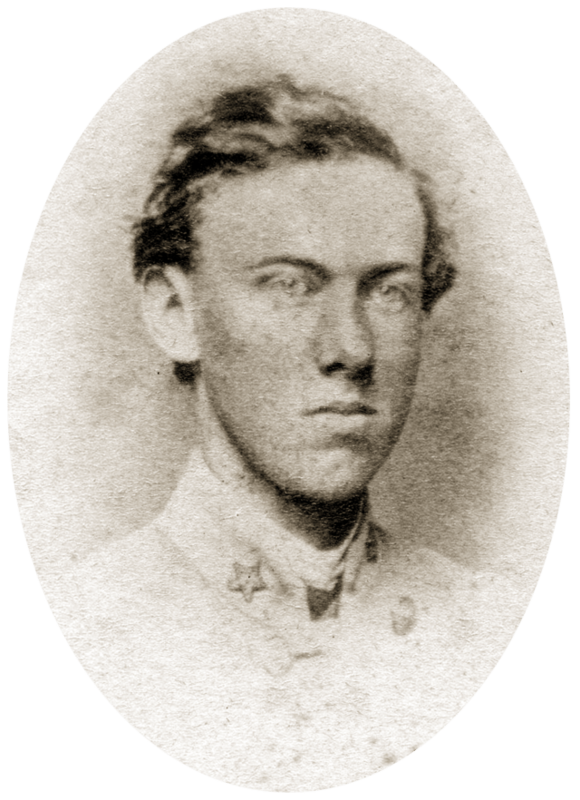 Pendleton served on the staffs of Jackson, Ewell, and Early and was mortally wounded at the Battle of Fisher’s Hill, September 1864. Now, I couldn’t make this trip completely focus on Pendleton, but I did make some good “discoveries” and thought it might be fun to write a post-script to my previous post. Fredericksburg, VA – Central Rappahannock Heritage Center: I found (and got to hold) Sandie Pendleton and Kate Corbin’s marriage license. The original, real one. They were married on December 29, 1863 – I knew that already, but it was awesome-cool-exciting to see the original document. Fredericksburg, VA – Battlefield, Jackson’s Position: Finally understood the topography and why the Union troops were able to break through Jackson’s line. While rushing to fill the gap with reinforcements, Pendleton was slightly wounded, but incapacitated for the rest of the day (December 13, 1862). Some researchers feel that Pendleton’s inability to stay in the fight hindered the organization of any large counter-attack that Jackson may have wanted to launch. 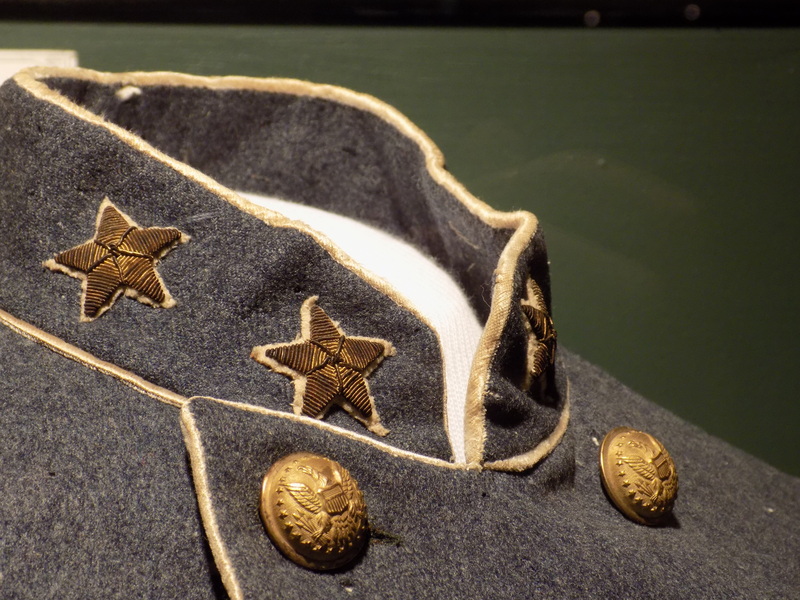 New Market, VA – Museum of Virginia, Display on the Lower Level: I came to a display case and noticed a well-preserved gray frock coat. Then I saw the sign. It was a complete “flank-attack surprise” emotional moment. I’d always wondered if any of Pendleton’s uniforms were preserved somewhere and definitely hadn’t expected to find one here! A close examination revealed either a bullet tear (or well-placed moth eaten hole) making it probable that this was Pendleton’s coat when he was mortally wounded. Woodstock, VA – Corner of Dingledine and Muhlenburg (or in local terms – turn on lawyer row…find the post office and the day care center…look under a tree between the two buildings): I knew about this memorial marker and wanted to be sure I found it. I’d asked a couple people for directions and each gave advice that guided me to the location. In the village of Woodstock, on a corner west of Route 11, I found the marker showing the location of the home where Pendleton died. The house itself is long gone. Few people stop at the marker (unless they are playing Pokémon Go). But there it is. Miles from Fisher Hill battlefield and a good distance from the field location where Pendleton was wounded, the home of Dr. Samuel Murphy was a refuge for the young colonel and where he lived the last hours of his short life. (He is buried in Lexington, VA). Sharpsburg, MD – Antietam National Battlefield, Jackson’s Line: Seeing the actual topography of the battlefield made me appreciate the communication and observation challenges facing all staff officers on September 17, 1862. Were there lots of things I missed? Places I should’ve gone? Archives I should’ve searched? Yes. Some I am aware of. However, Colonel Pendleton research was not the first objective of this trip, and I was pretty excited about what I did find. My only major regret is that I did not have time to fully explore and hike Fisher’s Hill battlefield. But it’s always good to have a reason to come back! Looking forward to another trip and more studies on Colonel Pendleton. This entry was posted in Emerging Civil War, Material Culture, Memory, Personalities and tagged Antietam, Central Rappahanock Heritage Center, Fredericksburg, marker, marriage license, monument, New Market, Research, Sandie Pendleton, travel, uniform, Woodstock Virginia. Bookmark the permalink. The passion of research! Love this! Thanks for sharing, Adrienne. Research is all about finding “hidden treasure” and finding a way to share it with others. On a future visit to Frederick go to the “Museum of Civil War Medicine”. Well worth a stop! I was actually able to go to the medical museum. Learned so much! GOING TO FISHER HILL BE IN GOOD SHAPE IT IS A WORK OUT . NICE PRESERVE BREASTWOODS. I STOOD WHERE MY BELOVED 36 VA INF STOOD WHAT A HONOR. Very interesting and am impressed by your dedication to the task and thoroughness of it. I need to go on a Virginia Civil War tour like you Sarah-as always your article was fun, entertaining, yet very educational. I love reading your pieces Sarah. I notice you write alot about 1862-do you have a favorite battle or campaign Sarah? I need to go on a Virginia Civil War tour like you Sarah-as always your article was fun, entertaining, yet very educational. I love reading your pieces Sarah. I notice you write alot about 1862-do you have a favorite battle or campaign Sarah? I notice one of your “likes” fans is decked out in Ohio State gear-im surprised they allow that kind of thing, lol!!!??? ?